In its last scheduled meeting of the year, Minneapolis City Council could give the go-ahead on a $400 million mixed-use development near the new Vikings stadium. Surface parking lots currently occupy much of that land. The Minneapolis Star-Tribune editorial board called the Downtown East neighborhood “a part of the city’s commercial core in desperate need of new life.” The newspaper stands to benefit from the project, as the editorial announces—they plan to sell five blocks of nearby property, including their current headquarters, and move downtown. With 1.1 million square feet of office space, apartments, retail space, and a park, the Ryan Cos. project could attract tax revenue to the city, as Wells Fargo is reportedly looking to anchor the development as a corporate tenant. It also includes a 1,625-space parking ramp. Mayor R.T. Rybak said that over 30 years the project will generate $42 million in property taxes for the city, $50 million for Hennepin County and $35 million for the Minneapolis public schools. The public-private partnership does not call for tax-increment financing. Instead, it asks the City Council to approve $65 million in bonds, to be paid off by revenue from the project’s parking ramp over 30 years. The developer would cover shortfalls for the first 10 years. 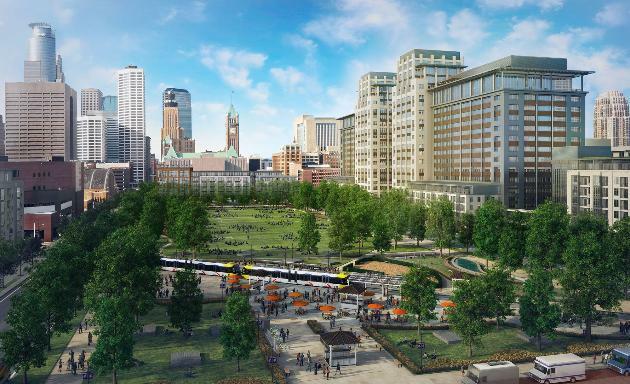 Minneapolis has embarked on several large-scale urban redevelopment projects, including a makeover of the city’s “Main Street” by James Corner Field Operations.